This 3 bedroom, 2 baths and 1,800 sqft home was sold within a month, independently by the homeowner, using our cinematic video tour; shot in the middle of winter. Please note: this video tour was shot as is without any staging or removal of excess clutter. The home was only marketed on Craigslist with a link to the YouTube video. Prior to using the video and Craigslist, the homeowner tried using a realtor. Unfortunately, the real estate agent chose to use unprofessional photography to market this property. The photos did not accurately represent the living space of this cozy home. The home sat on the market for 6 months and did not sell until the client used our video services. Review the unprofessional photography on Zillow and see what a difference our services can do to help market and sell your home or condo. We produce beautiful, engaging and informative cinematic video tours for businesses, Realtors, home sellers , and many of the top brokerages throughout Michigan. Clients use our professionally produced cinematic videos on Facebook, Twitter, YouTube, CraigsList, LeadingRE, plus other numerous real estate websites and blogs. Our in-house services include cinematography, editing, color grading, audio mixing, encoding with full HD output suitable for web, TV, Blu-ray or DVD distribution. Step up your marketing program by offering online video marketing available from Evolving Creativity, LLC! Contact us for more information or pricing at 616.308.9739 or email us at evolvingcreativity@gmail.com. > Review our Real Estate Photography & Video Preparation Checklist to ensure the best quality photography and video production. Great real estate photography makes your listings or business look more attractive. HDR stands for "high dynamic range". This type of photography contains a greater detail by eliminating over and under exposed portions of the scene. HDR exposure fusion and tone mapping photography requires extensive processing, resulting in images that are breathtaking and rich in detail with vibrant colors that are true to life. If you want stunning images that will reveal the ambiance of a space and appeal to your audience, include HDR architectural photography for your marketing needs from Evolving Creativity, LLC. Contact us for more information or pricing at 616.308.9739 or email us at evolvingcreativity@gmail.com. Are you using twilight photography on your real estate listings? 80% of the buying decision for a home is emotional. Twilight images are one of the easiest ways to create emotion in a potential buyer. Not only do they stand out online, twilight images let online homebuyers imagine themselves coming home to your gorgeous listing after a hard day's work. Set the mood and trigger emotion when you add twilight photography to your photography package. Consumers want to see it all! Panoramic photography allows online consumers to feel like they are actually standing at a location, looking around the environment. 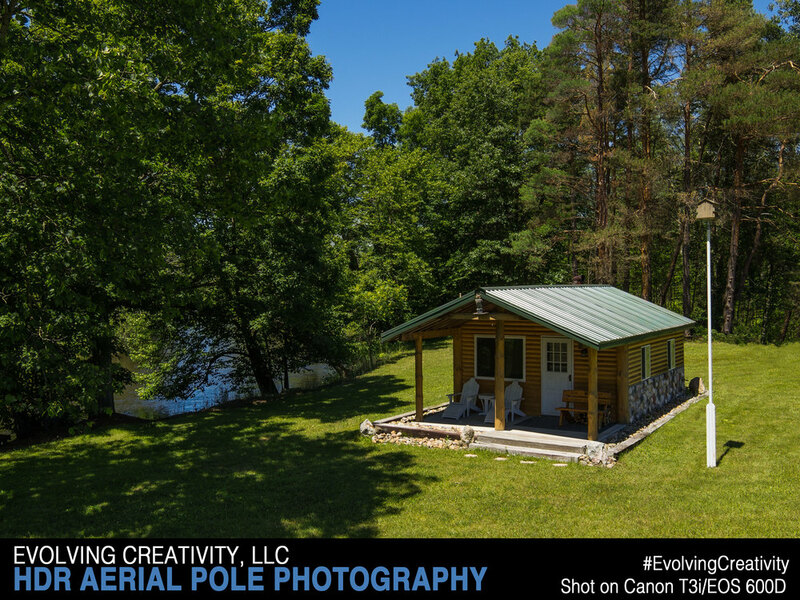 Let Evolving Creativity's professional photographers capture stunning high resolution panoramic images of your home/condo or business! Contact us for more information or pricing at 616.308.9739 or email us at evolvingcreativity@gmail.com. View an interactive 360 degree spherical panorama of a beautiful river front rustic cabin in Greenville, Michigan. View an interactive 360 degree spherical panorama of a natural scenic home in the woods near a small pond. View an interactive 360 degree spherical panorama of a scenic view from a dock overlooking a Michigan forest and bustling aquatic life.